Time to Go Pro - Bluewater Scuba - "Where Nashville Learns To Dive"
Dive leaders play an important role in teaching, guiding, and assisting divers. Here at Bluewater Scuba, you will find a comprehensive training program that will prepare you for the life of the dive professional. This is a serious commitment but the rewards are limitless. Accompany Open Water students under the indirect supervision of an Instructor during surface swims, navigation exercises, and staying with the group while the Instructor conducts skills such as ascents. Conduct any subsequent dives for Discover Scuba Diving, at a ratio of 2:1 (if insured), after they successfully completed the first dive with an Instructor. 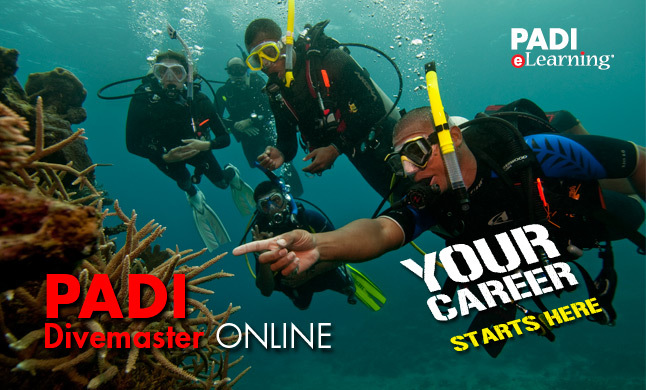 Accompany certified divers during training dives, generally supervise training and non-training activities, assist a PADI instructor in the confined water (increase ratios by 4 additional students) and assist in the open water (increasing ratios by 2 additional students) for the Open Water course. Also, your assistance can increase the allowable student ratio for an Instructor by 4 additional students for courses beyond the Open Water course. Training will consist of 6 classroom/pool sessions and 3 open water sessions.